Featuring Intel Core Duo, starting at $1999. Apple contacted us today and told us they just released the blazing fast MacBook Pro. MacBook Pro raises the bar for notebooks with an all-new architecture, a 15.4-inch widescreen display, and all the features you need to work and play wirelessly. Powered by a dual-core Intel engine. Up to four times the speed of the PowerBook G4. Eight times the graphics bandwidth. With built-in iSight for instant video conferencing on the move. And Front Row with Apple Remote to dazzle everyone in the room. Wait no more. 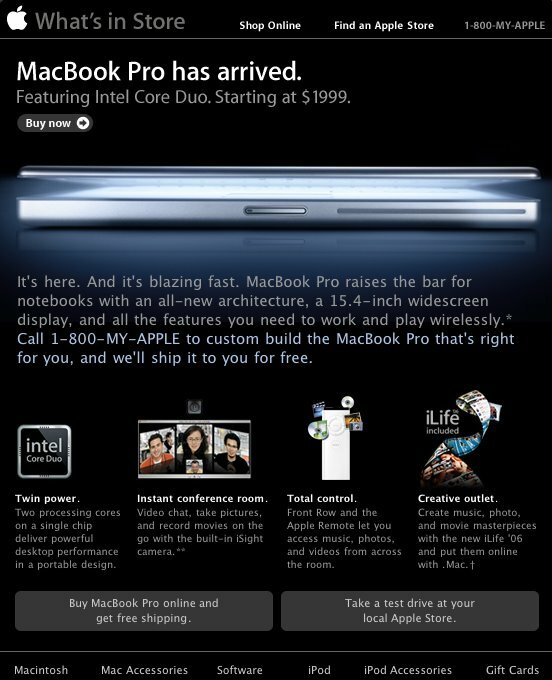 MacBook Pro starts at just $1999. 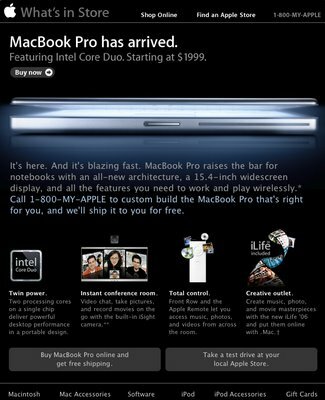 This is the first Mac notebook built upon the revolutionary new Intel Core Duo — which is actually two processors (up to 2.16GHz) engineered onto a single chip. It provides 2MB of Smart Cache, L2 cache that can be shared between both cores as needed. It delivers higher performance in 2D and 3D graphics, video editing, and music encoding. And the new engine is only part of the story. MacBook Pro has a frontside bus and memory that, at 667MHz, runs faster than any previous Mac notebook. It’s the first Mac notebook with PCI Express, a Serial ATA hard drive and the ATI Mobility Radeon X1600 for superfast graphics performance. Sit down. Click on someone’s iChat icon. And video conference from anywhere in the world. Though you can barely see it, there’s an iSight camera built into the thin bezel just above the display. So now you can conference with associates during the day and chat with the kids at night. iChat AV lets you video chat with up to three other people simultaneously. And when you go head to head, you'll see your colleague more clearly, thanks to the VGA resolution made possible by the superfast Intel Core Duo. MacBook Pro also comes with Apple’s new Photo Booth application, a fun program that lets you take warped and Warholesque snapshots. With the new iLife ’06 (included, of course), you can even record movies with iSight right into iMovie, then use the new iLife’s newest application, iWeb, to create a video blog entry or podcast in just a few clicks (2) . The first notebook to deliver the Front Row media experience, MacBook Pro makes it easy (and rather spectacular) to showcase your latest creations. Whether you’re at the client’s office, on location, or back at your hotel room, you just use the Apple Remote to control your videos, music, movies, and more. Front Row lets you quickly navigate through your work and play from anywhere in the room. You can even use the Apple Remote to navigate through Keynote presentations. Do something. Say something. Make something. MacBook Pro comes with iLife ’06 , a suite of easy-to-use applications that make it easy for anyone to make postcards, calendars, DVDs, websites and podcasts. Even professionals with proficiencies in high-end applications can appreciate the ease of creating initial compositions. Or posting pictures, videos, and commentary of current events almost before they happened. Enjoy the freedom of the press on MacBook Pro. (2) .